Update 1.2 for World of Tanks Blitz has been submitted for Apple's review, meaning the release date is within 2 weeks from now. Tier VI-VIII vehicles are added in tech trees - SU-100Y, Dicker Max, Panther M10, Lowe, T34. All of them can be purchased for gold. Added quick auto aim control that enables/disables auto aim (aiming assistance) directly in batle. Works independently for arcade and sniper modes. Very convenient thing, using it myself. Added new notifications for garage header. The most important of those are battle results and gifts. E.g. if you left the battle for garage, you will see the popping header with the results. Added ability to share battle results on Facebook. Decreased battle tiers for tier III and IV vehicles, and T2 Light to +/-1. It means that all tanks up to tier IV can only meet vehicles one tier below and above. Being unplatooned ofc. Increased experience to get 100% crew skill. Rebalanced tier I-III automatic guns. Decreased cassette damage and reduced reload time to maintain DPMs. Reworked battle tutorial: added reaslistic grass, animated trees, changed tanks. In future updates these visual improvements will be available for all maps. Previously researched modules are now mounted automatically for newly purchased vehicles. Battle results for 10 battles are now saved on mobile device and available even after the game restarts. Changed condition for Patrol Duty achievement: 4->3 vehicles. Updated some interface elements for Retina resolution. Improved layout for chat interface on iPhone. Fixed incorrect marker for destroyed T40 tank. Fixed textrures for Ferdinand tank. Volume level setting is now saved after the game restarts. Fixed description for Hunter and The Lion of Sinai achievements. Removed vehicles that are not in the game yet. Fixed icon for Raseiniai Heroes' Medal. Fixed bug when renamed player couldn't enter chat. Game now works in background mode for up to 3 minutes (connection to server is kept, you can minimize the app now). Optimization for texture quality on iPad 2, iPad Mini, iPhone 4S. The game should be more stable on those devices and crash less. In early 1941, whilst Germany was still mostly ascendant, a war broke out away from most of the more well known theatres. This little known war could have had huge ramifications for both the Axis and the Allies, yet it’s almost unheard of. The campaign itself was largely decided by air power. The whole of the Middle East has a very complex and turbulent history. By World War Two it was a series of countries that were relatively new constructions set up after the collapse of the Ottoman Empire. One of these new countries was Iraq, first granted independence in 1932. From 1933 to 1941 Iraq had six coups and many religious uprisings. The last of these, in April 1941, put Rashid Ali al-Gaylani in power as Prime Minister. Rashid Ali was extremely anti-British: despite this Iraq was allied to Britain, whom had been training and equipping the Iraqi armed forces as well as pouring funds into the country to help develop Iraq’s infrastructure. The British also supplied assistance with developing the country’s oil resources. At the time the Middle East produced a fraction of the world’s oil supplies with the US being the major producer. Despite this, even Iraq's limited output would have solved most of Germany's oil problems. Britain's treaty with Iraq gave them certain rights. It allowed the UK to have two bases on Iraqi soil and allowed the transit of forces through the country. This was because Iraq was a stepping stone on the transit route by air to the Far East and India. The two bases the British maintained were RAF Habbaniya and RAF Shaibah. Number 4 Flying Training School (FTS) was based at RAF Habbaniya, with a motley assortment of aircraft. 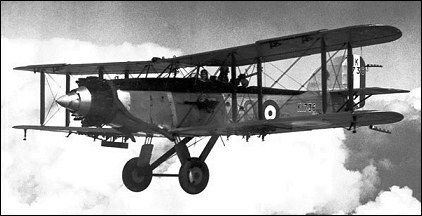 On strength it had eighty four airframes, which included six Gloster Gladiators, twelve Hawker Audaxs, seven Fairey Gordons, twenty seven Airspeed Oxfords and twenty five Hawker Harts. The largest bomb any of these aircraft could carry weighed only twenty pounds. Over half the aircraft couldn't even manage that. As the situation worsened a cabal of junior flying officers and instructors turned their attention to arming these aircraft. This initiative was met with resistance by the commanders of the base. However the junior officers doggedly persisted, even going as far as to ignore direct orders to increase their bomb loads. On the night of April 29th the Iraqi army moved out on "exercise". This exercise saw them entrenched by the morning of the 30th on the plateau overlooking RAF Habbaniya, with tanks, artillery and several thousand men. "If you have to strike, strike hard." The RAF would launch an all-out offensive against the besieging Iraqi Army at first light the next day. As it happened May 2nd was a Friday, the Muslim holy day. As the soldiers knelt to begin morning prayers thirty nine aircraft from No.4 FTS and ten Wellington bombers from RAF Shaibah were overhead, all trying to avoid each other in the cluttered airspace above the plateau. At first light the RAF aircrews could distinguish the gun positions and started their attack. The Iraqis responded immediately with a storm of anti-aircraft fire. The Germans had supplied light AA guns to the Iraqis. Meanwhile the Iraqis began to shell RAF Habbaniya. The AA fire was so intense that every aircraft overhead was hit. Nine of the ten Wellingtons were damaged and put out of service for repairs when they landed. The tenth had one of its engine damaged and was forced to land at RAF Habbaniya’s airfield. Despite efforts of the ground crew to tow the aircraft to safety the Iraqi Artillery ranged in on it and set it on fire. During that first flight one Audax returned to base with 52 bullet holes. Pilots would land, re-arm, grab new targets and take off again without shutting down the engines, just to keep the sortie rate up and the ordnance falling on the Iraqi Guns. As well as the shelling, the Royal Iraqi Air Force joined in the attacks on RAF Habbaniya. Normally a number of Iraqi Gladiators would strafe the airbase and then a reconnaissance over flight from S.79 Bombers at 20,000 feet would follow. On one occasion, seeing the S.79s coming in, a pilot managed to scramble a Gladiator and claw up to that altitude. The Gladiators didn't have oxygen systems fitted; gasping for breath the pilot caught up with the S.79 and pressed the fire button on his control column. All four of his guns had iced up and jammed. During the first day in over 14 hours of combat the 39 pilots had flown in excess of 193 sorties, with 22 aircraft damaged or destroyed and 10 pilots put out of commission, including one who developed appendicitis at midday. The Gordon bombers had developed new ways of terrifying the Iraqi soldiers. They had started bombing from an altitude of ten feet! The pilots disarmed the safeties on the bombs and fitted seven second fuses. This meant they could just get outside the blast radius of the bombs going off. This was used to great effect to knock out an Iraqi AA gun that had been infiltrated behind a brick shed under the flight path for the runway. On the third day, four Blenheim fighters appeared overhead. These were valuable reinforcements sent to aid the base from Egypt. However, the pilots hadn't been briefed on the situation and carried out normal landings, presenting a perfect target for the Iraqis! As luck would have it a flight of Audax bombers were airborne, saw what was about to happen and commenced a very close bombing run to keep the Iraqis pinned down. One Blenheim actually flew through the dust cloud kicked up from an exploding 250 pound bomb! When on the ground they saw the nearest airmen racing towards them directing them to safety, the Iraqi soldiers shooting at them with small arms added to the message. Luckily despite some superficial damage all four Blenheims were saved. The next day one of these powerful fighters took over the standing patrol. When two Iraqi Audaxs dove onto the base both were easily caught and shot down by the Blenheim. Everyone watching in the base cheered. From then on the Iraqi Air Force attacks slacked off and became much rarer. 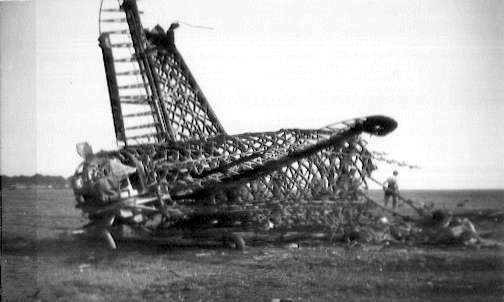 Despite this the days of constant shelling and flight operations had caused exhaustion in the defenders. On the 5th day of the siege more bad news arrived. Every morning an aircraft was sent for a reconnaissance flight around the surrounding area. The pilot returned early with the grave news - a huge column of Iraqi soldiers was driving down the road from Baghdad! Upon hearing that news every aircraft was readied to fight and launched in an all-out strike against the column. Whilst arming and preparing these aircraft the situation changed again. The Iraqi soldiers on the plateau - demoralised from suffering round the clock bombing for five days - routed; leaving behind most of their weapons they fled up the main road en masse, their morale shattered. The two columns of Iraqis met and caused a massive traffic jam preventing either column from moving. All this happened as the RAF strike force arrived overhead and began bombing. During that afternoon the RAF mounted 139 sorties. The bombing halted as dusk fell. The last pilot on the scene reported the Road to be a solid ribbon of fire. The siege had been lifted! During those five hectic days No.4 FTS had flown over 700 sorties and dropped around 3000 bombs. From the starting strength of thirty nine pilots the school had lost 13 killed, 21 wounded and 4 were suffering combat fatigue, and the war wasn't over yet.